Once upon a time in a very poor villiage lived an ambitious young man and his family. A family lives in poverty, but the father has dreams of a better life for them – a toy for his child and a dress for his wife. But one day he finds a bag of treasure in his field and life turns around magnificently…but then…things go wrong, very wrong. And the man realizes that life’s treasures will never truly be good without his family by his side. I think this one has potential but I am confused by it. Both by the intended audience and the content. According to the author, this book is intended for adults but the simplistic storyline, the relatively few number of pages and the illustrations definitely put it in a younger category (in my opinion). But this novel was supposed to be a moral story for adults (about appreciating what you have and not lusting after monetary items), but I don’t think it was complex enough for adults to truly appreciate it. This book felt rougher than the author’s other two novels. There were a few issues with grammar and the sentences (in general) felt overly stiff and formal. No one dared to ask the family how they became rich but there was a rumor circling that the family might have found a treasure bag. 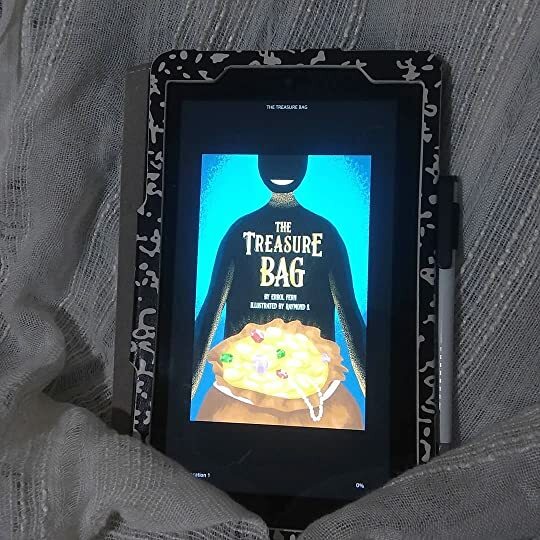 And while that line would be fine in a children’s book, for any older audience it immediately becomes suspect – as in how does a treasure bag rumor even start? And why in the world wouldn’t people immediately ask where the money came from? I was not a huge fan of the illustrations for this one – they did not have the same charm as the previous Fern books and did not enhance the book for me. The dark colors and lack of faces made them almost…. intimidating. As if this was supposed to be a horror picture book.